Mary Rich is one of Britain’s most well known potters. 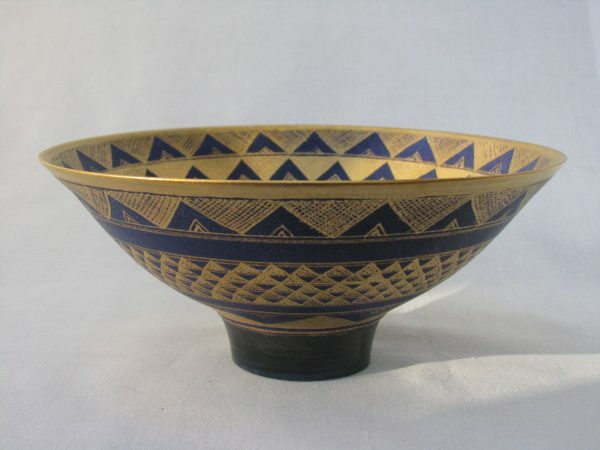 Working from her Cowlands Creek Pottery studios, near Truro in Cornwall, she painstakingly produces finely thrown pieces which she decorates in geometric style with precious metal lustres. Each piece takes many hours to produce and the final results glow with muted golds, greens and blues. Although her ceramics may be seen as vehicles for her exquisite decoration, form is crucial to her work. Mary’s pots are hand-thrown in porcelain. Most of her pots have several layers of colour applied to the raw clay to achieve exactly the right base for her final decorations which are added after the glaze firing – characteristic designs applied with liquid bright gold and other lustres, using fine brushes. She also makes pieces in Limoges porcelain finished with a white glaze, sometimes with a little added colour. Mary has been working as a full time potter in Cornwall since 1962. She is a Fellow of the Craftsmen Potters Association, a member of the Devon Guild of Craftsmen and of the Cornwall Crafts Association.